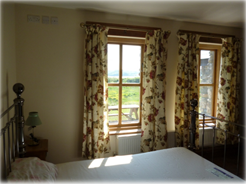 Ferryside Farmhouse [The Country Retreat] has recently been renovated into a period stone property offering Bed and Breakfast [Cereal and Toast, Orange Juice, Tea or Coffee] by the sea. Breakfast is made available in the lounge area [The Granary]. The Granary can also be made available for family and friends to host small family gatherings for birthdays and other special occasions. The Granary offers sea views and can seat between twelve and fifteen people. Sleeping accommodation comprises of 3 double bedrooms, all en-suite with three luxury king size beds [sleeping 6 people in total]. 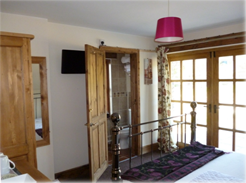 Each room has a flat screen Tv’, en-suite shower, mirror and hand towels. 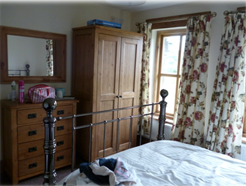 All beds are made up ready prior to arrival with bed linen and hand towels provided. Offers a luxury king size bed, wall-mounted flat screen television – complete with Freeview, alarm clock, hairdryer and complimentary tea & coffee making facilities. The Meadows looks out over green hills to the rear of the property. Guests of the Meadows can access the rear patio area for a quiet coffee before breakfast. Castle View is fitted with a bath as well as a shower. This room offers a luxury king size bed, wall-mounted flat screen television – complete with Freeview, alarm clock, hairdryer and complimentary tea & coffee making facilities. 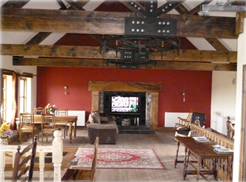 Also available is the Granary, a lounge with two sofas and a 50′ flat screen Tv for use by our guests. The Granary also offers an open plan kitchen, with two dinner tables seating between twelve and fifteen guests offering sea views.